In a recent article we talked about how a chaotic approach to writing a proposal can erode the quality. We also told you we’d show you how to impose some order on the chaos. Check out this flow chart that shows these steps in the process. You can tweak it to fit your situation, but experience tells us that this is a pretty efficient process to follow. Here’s a run-down on the basic steps. Determine the client’s proposal preparation requirements. Regardless of how small your proposal effort is or how little time you have to prepare the proposal, you must determine exactly what the customer wants you to do and how he wants you to explain it to him. Develop your Win Strategy. Identify the client’s concerns and how you will resolve them. Determine the likely competitors and what you think they’ll offer. And begin driving out clear and distinct benefits you bring. Note where this activity is in the process—before the go/no-go decision. This is the logical place for it; you can’t really make an informed go/no-go without thinking hard about what the client wants and if you can really deliver. Make an informed go/no-go decision. However you make your go/no-go decisions, base them on what you know about the client and the competition. Don’t rely on gut instinct or misplaced optimism. Plan your proposal project. Proposals are projects; treat them that way. Rough out a schedule of what to do on the proposal by when. Jot down who you want to help you, then check to make sure they will be available when you want them. Up-front planning will save major headaches downstream when you are scrambling to finish. 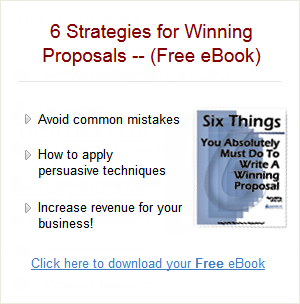 Develop your proposed approach to giving the client what he wants. Take the time to map out how you will do the job. Identify critical issues to make sure you know what the potential obstacles are; you’ll be able to highlight those in your executive summary/transmittal letter. Identify deliverables. If you are offering a service, draw a quick flow chart showing how the tasks relate to one another. Once you have planned the project, you can identify and contact potential project team members. Do this early; your in-house people will have to check their availability, and any subs you want to include will have to go through their own go/no-go process. Write the proposal. This, of course, is the heart of the process. But note how many activities occur before the writing. Too often, proposal teams want to jump right into the writing, without really thinking through the other activities. Or, teams wait until the last possible moment to begin the proposal, which means they have to start writing immediately, just to make the deadline. If you follow the process, the writing itself becomes easier because you’ve been thinking it through as you hit each step. And, if you’ve done some of the other things up front—such as identify your project approach and get your subs on board early— then your plate will be a little less full, and you can devote more time to the writing itself. Conduct reviews. Reviews are critical to the quality of the proposal. You should have at least two reviews, one at the second draft (called a Red Team review) and one at the final draft stage. Above all, don’t just review the draft in the final hours before the proposal goes out the door; it’s too late by then. A final word. Sometimes you simply don’t have time to follow each step religiously. In those cases, make sure you have a win strategy, a rough schedule, and a second draft review. Or maybe if you’re that short of time, you really shouldn’t write the proposal.